Blyth Palmer always bucks the trend though. He had 13 trout last time he was here at the weekend and another 12 today. He had a lovely 5 pounder this morning but caught on his favourite pattern - the Fluffcat. Blyth has six favourite patterns he uses here but they aren't standard stuff. He's been kind enough to let us have a look. No emergers here - they aren't his style - but these are certainly deadly patterns. Left from top: Orange & Coral Blob; Yellow Buzzer - this has the finest silver glitter in the varnish; Black buzzer with a tiny red bead head, red wire rib and the finest peacock herl collar. 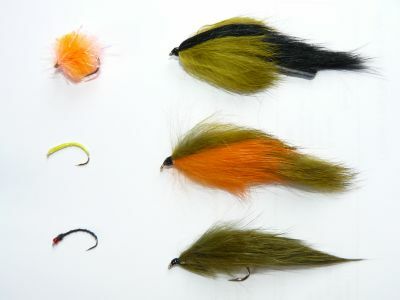 Right from top: The Fluffcat; The Double 'O' - (olive & orange); finally the Olive Zonker. Blyth's tip - vary the retrieve!